These ominous words, in a small text box, open Malcolm X: A Graphic Biography, published in 2006 by Hill and Wang/Serious Comics. The text appears on a full-page recreation of the iconic 1964 Ebony photograph of Macolm X holding a rifle as he peers out a curtained window. 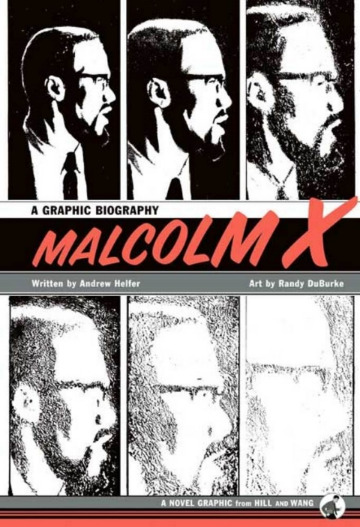 On the page that follows, illustrator Randy DuBurke closes in cinematically on Malcolm’s face over six panels, blurring and de-saturating Malcolm’s face until the iconic image becomes unrecognizable. From this point on, the graphic biography develops a narrative that visually and textually deconstructs the icon, stereotypes, and legends of Malcolm X. Writer Andrew Helfer, a group editor and creator at DC Comics, draws on his experience with superheroes to uncover and create the human rights activist’s origin story. Beginning with Malcolm’s account of his mother defending her home against the Ku Klux Klan while she was pregnant with him, Helfer shows how Malcolm’s memories informed his identity and understanding of his own destiny. Although he relies heavily on The Autobiograpy of Malcolm X, Helfer places Malcolm’s recollections in conversation with conflicting accounts from other selected biographies of Malcolm X. He notes that Malcolm’s mother had no memory of the event with the Ku Klux Klan. Yet, far from undermining Malcolm’s memories, Helfer’s display of contradictions thoughtfully present Malcolm’s recollections as being inseparable from the all-encompassing experiences of racism in America. Noting the discrepancies, Helfer describes Malcolm’s formative memories: the dismantling of his family due to poverty, the racist jokes about “benevolent” foster parents, and Malcolm’s prison sentence for burglary, which also included punishment for the crime of “corrupting white women.” In doing so, Helfer never shies away from the dehumanization Malcolm experienced. However, he remains attentive to Malcolm’s agency, focusing on Malcolm’s responses, particularly his conversion to the Nation of Islam and the hunger for knowledge it produced in him. When Elijah Muhammad, the leader of the Nation of Islam, replaces Malcolm’s last name “Little” with the iconic “X”, Malcolm’s place within the black separatist group and Civil Rights Movement appears secure. By the time Helfer depicts Malcolm X entering the consciousness of the American public, more than half way through the comic book, it is clear that he is a complicated man driven by a desire for justice. Because of Helfer’s attention to the details of Malcolm’s life prior to his public role, the fear-mongering stereotype of “the angry black man” dispelled by documentaries and articles published in the early sixties fall flat. Helfer ensures that Malcolm appears as vulnerable as he is powerful. As the comic book nears Malcolm’s assassination, the opening image of Malcolm holding the rifle, which has often been depicted in the media as a call to arms, embodies the reader’s knowing dread and Malcolm’s fear that his dissention from the Nation of Islam may cause his death. Although Helfer reserves conclusions as to who ordered Malcolm’s death, his narrative of Malcolm’s life suggests that Malcolm’s intelligence, charisma, and drive posed a threat to not only the white establishment but to the leadership of the Nation of Islam as well. Helfer ultimately creates more questions than answers when it comes to Malcolm X. His work suggests that all biographies will fall short in capturing the real Malcolm. DuBurke’s murky illustrations echo Helfer’s enigmatic narrative. His muddled, dark style often recalls the smudginess of old newsprint photograph and suggests that there was much obscured in contemporary accounts of Malcolm’s life, work, and death. From Spike Lee’s biopic to Malcolm X for Beginners, many people have attempted to distill a single image of Malcolm X. By pointing to the unknowns with the knowns, Malcolm X: A Graphic Biography creates a space for readers to consider Malcolm X ‘s contributions to black rights in America and to ask what work still needs to be done.